21 July 1966 - The last of members of the 111th Light Anti Aircraft Battery Royal Australian Artillery (111 LAA Bty RAA) returned to Australia from a 26 month deployment in the Indonesian Confrontation with Malaysia. The Confrontation was an undeclared war. From 1962 to 1966 President Sukarno attempted to destroy the newly established Federation of Malaysia. A failed attempt to seize Brunei was following by increasing cross-border raids. The Australian forces deployed were tasked with protecting the Malayan peninsula from incursions. 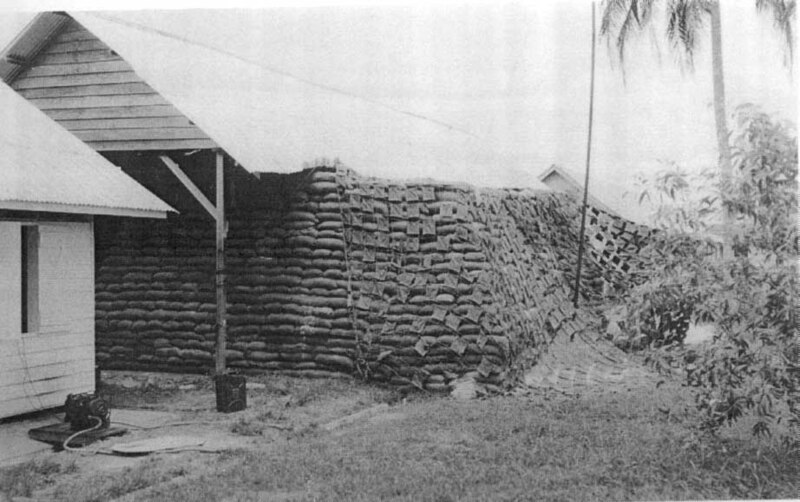 Command Post 64 - Butterworth, Malaysia, 1964 - "Air Defence LAA Batteries RAA, http://111.ebm.net.au/"
If the war was undeclared, then so too was the return of the 111th. The political climate of Australia in 1966 was tense; fraught as it was with civilian protest over Australia’s involvement in Vietnam and the issue of National Service. It was a climate with which many of the members of the 111th were as unfamiliar, as they were with South Australia, the state in which they were to reform their unit. Uniforms, it was advised, were not to be worn outside barracks. The regular events organised by the Save Our Sons movement, and other groups opposed to conscription, were to be scrupulously avoided. It was not the homecoming for which the member of the 111th would have wished. Click here for more information about the Confrontation or here for more about the 111th Light Anti Aircraft Battery.